Classic company merges with a classic technique. Maine is the quintessential state for producing some of the best handmade footwear that hasn't really changed. Converse has been making their now infamous footwear since 1908. During the 20's, 50's and 70's Converse delved into making more footwear for the wild outdoors. Now the company has revived that movement together with the Highland Boot Company of Brewer, Maine in a super cool remix of their Chuck Taylor All-Star with the Made In Maine Boot. 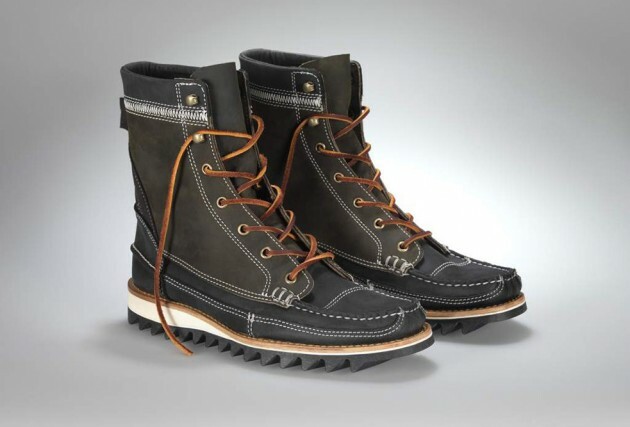 The boot is constructed of the finest quality from oiled chamois Horween leather from Chicago and a very heavy duty Vibram Jumbo Ripple outsole formed with leather board construction ensuring that it can be replaced after years of wear. The leather laces and the contrast stitching on the exterior give the shoe a well-crafted precision strength that adheres to the spirit of The Highland Boot Company and the classic appeal of Converse. This is an extremely limited boot being treated as a First String release with only 80 pairs available at Converse boutiques in New York City and Boston for $350 a pair, which is not bad considering the platform construction and quality of materials. The release date is today so get on it! !